Safely secure your boat outdoors in our Redlands storage area. Owning a boat can be a very joyous experience. The days spent on the water with family and friends form memories that will be cherished forever. However, there is more to owning a boat than planning fun social engagements. Maintenance and storage are two of major aspects of owning a boat that cannot be overlooked. 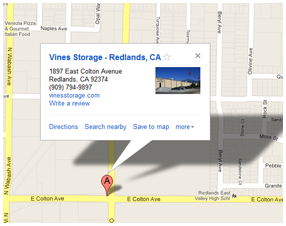 Vines Storage offers both indoor and outdoor storage options. For people who use their boat seasonally or not on a regular basis, boat storage can be cause for concern. Some people may park their boat in their driveway; however, depending on the size of the boat, the number of vehicles owned per household, and the threat of theft level, this may not be the most viable of storage plans. Also, in certain residential communities, zoning laws may prohibit boats being parked in streets or driveways. Indoor storage options may be more ideal; but, they can also be more expensive. For peace of mind, we provide secure outdoor boat storage. Our facilities include 24/7 camera surveillance, 8 foot walls, and security passcodes. This also provides an easy and effective way to be able to hook your boat to your vehicle when you want to get on the water. Patrons can check on and inspect their boat seven days a week. Our facility also includes many amenities for our patrons. We offer ice, purified and filtered water, moving boxes, packing tape, and more. For a small fee, we also offer boat detailing for those who do not have the time to do it themselves. To find out the costs of keeping your boat stored outdoors, a form is available on our website to fill out. Type in the relevant information and we will get back to you promptly with a rate and financing options. If you choose Vines Storage, and enjoy the security and amenities offered, you can get $30 for referring a friend. Don't let fears of maintenance and where/how to store your boat bar you from purchasing one of the most fun-inducing decisions you can make. Enjoy your boat and let us help you with all your storage needs.